I’ll be providing the Nexus documentation in tranches. This is the first part of the series. Eventually, all of this will end up in a single document. Let’s start with the Basic Kit. 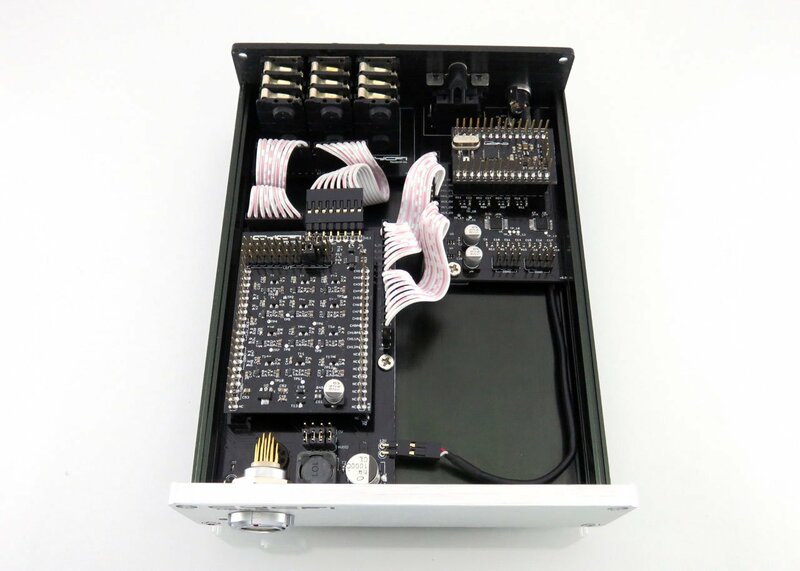 The Basic Kit includes the 1) Main Board where all signals from the multichannel input as well as control voltages pass through, plus where power regulation and conditioning are handled, 2) I/O Module: 12 channels where each channel can be configured as an input or output. Typically, these are used to send multichannel audio to your effects, amp, mixer or multichannel audio interface. But, if you do not need all 12 channels, they can also be configured as inputs (e.g. Foot switches and Expression pedals). 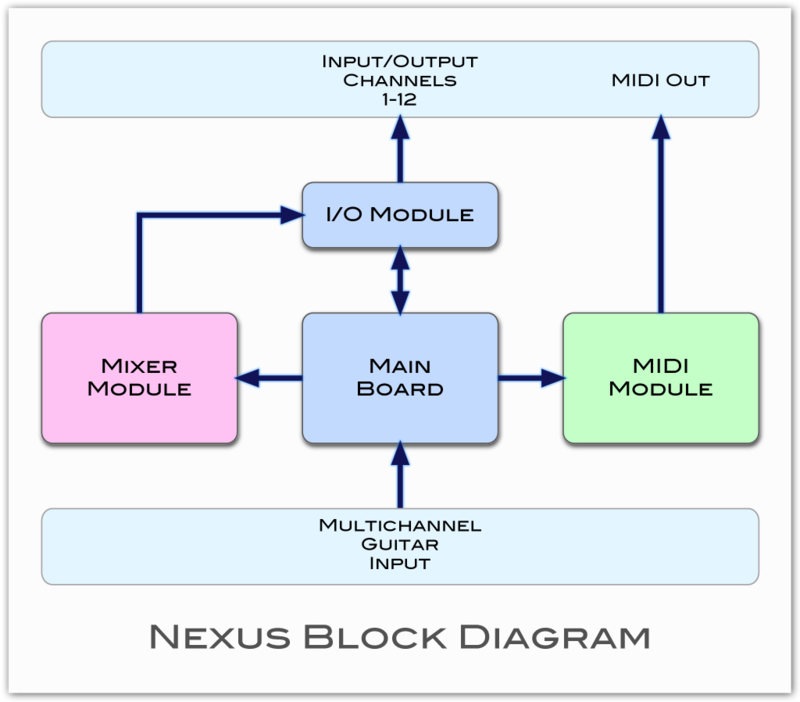 The Basic Kit includes the blue boxes in the Nexus block diagram at the right. 1) Audio signals from the multichannel Nu pickup together with outputs from one or more monophonic pickups, 2) control voltages, and 3) power are sent through a single 19-pin LEMO compatible connector. There are no fast-moving digital signals passing through the cable. Only audio and analog signals plus clean power (using ultra-low noise voltage regulators and a capacitance multiplier) are sent through the cable. That is intentional. The rationale is that we want to keep the signals as pristine as possible. High-frequency digital signals can and will corrupt the audio signals through crosstalk along the cable. Up to 12 channels of audio are available. 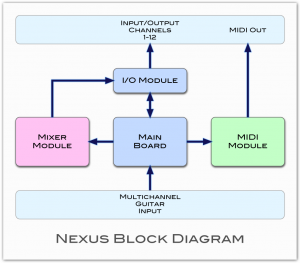 Audio sources may come from either the Nu multichannel pickup, or other monophonic pickups. Ideally, it is best to avoid direct switching using the traditional 5-way or 3-way toggle switches. Instead, make all outputs from all pickups available and rely on remote (by-wire) switching using MIDI patch changes with a special 5-way switch that sends control voltages. Channels 1 to 8 are audio only. 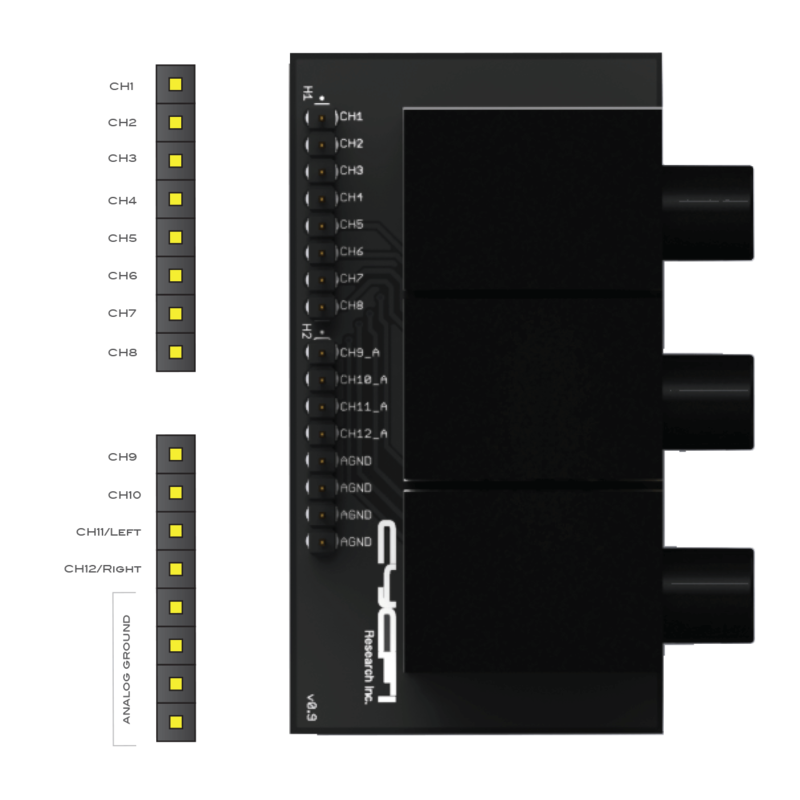 Channels 9 to 12 can be configured to receive either audio or control voltage (CV) using configuration pins (more on that later). Control voltages are converted to MIDI messages by the MIDI module (more on that later). Standard in-guitar controls include a 5-way switch for patch settings and potentiometers for volume control, EQ, as well as generic parameter control. Other cool ideas such as a ribbon controller for pitch bend may be provided in the future. Note: Please do not be confused with MIDI control and MIDI conversion. We are not doing any pitch tracking and MIDI conversion of the notes. Audio/CV Selector These configuration pins set the functions of Channels 9 to 12. For each channel (9 to 12), place a shunt to select either Audio (shunt at the right) or CV (shunt at the left). 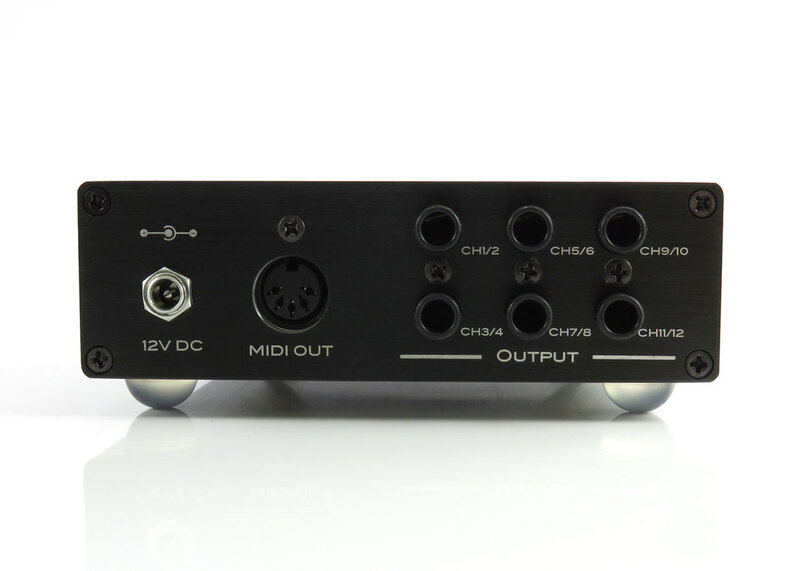 Audio Output Multichannel Output Channels 1 to 12. Control Voltage Control Voltage Output Channels 9 to 15. MIDI Module Power Power distribution for the MIDI Module. MIDI Module CV Input MIDI Module control voltage input. 12V Power Main 12 volts power input (1A Max). The Nexus is designed to be hackable. Space is provided for custom electronics and expansion. 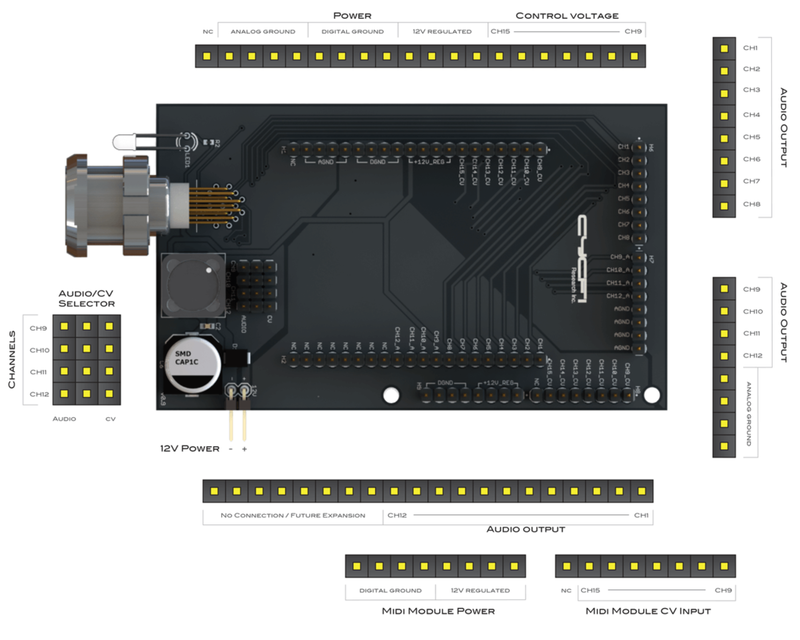 There are expansion headers with all 15 audio and CV channels available. The front panel is intentionally kept bare with just the 19 pin connector. The front panel may be populated with buttons, controls and displays. The I/O module includes six high-quality stereo Neutrik jacks which can be utilized as input or output. 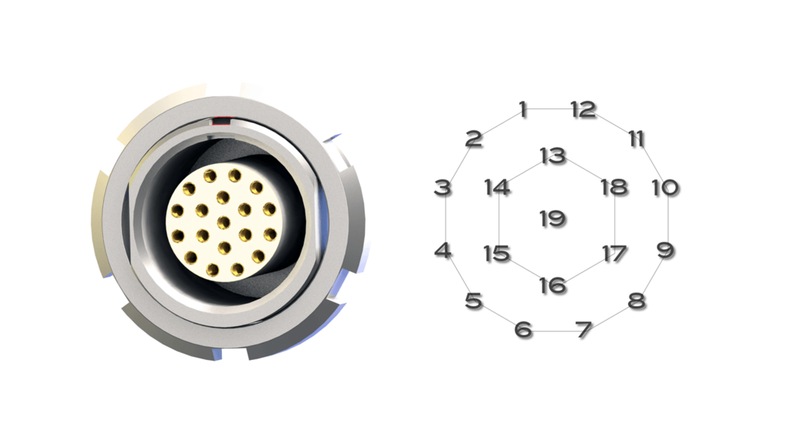 By default, the connectors are tied directly to the Main Module Audio Output for a total of 12 output channels. In many cases, however, you do not need all 12 channels so you can repurpose unused back panel jacks as you see fit. Example 6-string setup: One jack is connected to a sustain switch while another jack is connected to a volume pedal. Yet another jack is connected to a dual foot-switch to provide additional patch/bank select control in addition to that provided by the in-guitar 5-way patch select switch.